Off the Beatle Track - the rare FIRST Beatles album! IN 1962 the Beatles had already passed their 'audition' with George Martin for EMI. In September that year, the Beatles met with George Martin in Abbey Roads studio to start their first recording session proper. But there were three problems. Problem 1: While Martin was uncomfortable with Pete Best's drumming, he had already decided to use session drummer Andy White in Pete's stead. But knowing that the good looks of Pete were an asset to the Beatles, Martin didn't bring up the topic with manager Brian Epstein before the session. Besides, it was common practice to use session musicians for bands in the studio, especially with the costs involved with multiple re-takes. Epstein agreed, consoling Pete that he will still be the live drummer for the band. Problem 3: What to call the album? Brian Epstein wanted the name of the first single in the title, hence the name, "How Do You Do It - and 13 other songs". 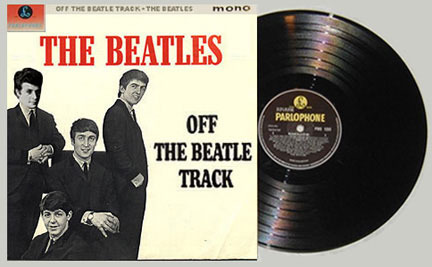 However, the Beatles themselves sided with George Martin, who had come up with the title, "Off the Beatle Track". With these three problems solved, the Beatles started off their phenomenal career with a number one single and a chart-topping album! Their next single, a re-vamped "Please Please Me" became their second number one. England was on the throes of Beatlemania! DISCLAIMER: While this story is entirely FICTION, we were inspired by the true facts in the fantastic Beatles book, THE WALRUS WAS RINGO: 101 BEATLES MYTHS DEBUNKED, by Alan Clayson and Spencer Leigh (reviewed in this issue). The title of chapter 20 is: "George Martin chose 'Love Me Do' for The Beatles first single as John and Paul hadn't written anything better." The only shred of truth in this story is the names of the songs that John and Paul HAD written before the Beatles first commercial recording session with George Martin in September of 1962.